Hummus is a popular appetizer and spread in the Middle East; it is generally made of chickpeas, tahini, lemon juice, and garlic, but due to its creamy texture and fresh taste it is the perfect base to add other ingredients, such as vegetables, nuts, and cheese. This spinach and feta hummus is an excellent variation, combining fresh spinach with rich, crumbled feta cheese, making for the ultimate appetizer. Serve with pita triangles, pita chips, tortilla chips, pretzel sticks, or vegetables such as carrots and celery. In a food processor, combine the drained beans, tahini, spinach, garlic, olive oil, and lemon juice. Blend well. Add cheese and red pepper flakes and blend into a smooth and creamy dip. Serve with pita bread, pita chips, or fresh veggies. 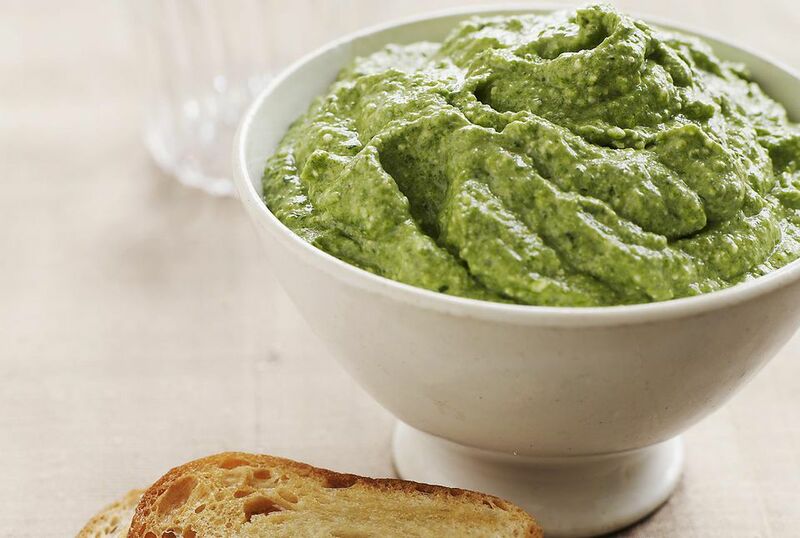 This spinach and feta hummus can be made up to 2 days in advance. Store in an airtight container in the refrigerator. Serve the spinach and feta hummus either hot or cold. Tahini is a paste made from sesame seeds; it has a similar consistency to peanut butter. The oil in tahini often separates and needs to be mixed in before using. It may be challenging to find prepared roasted garlic, but it is simple to make your own. All you need are heads of garlic, olive oil, and salt and pepper. After slicing off the top third of the garlic head, cover with oil and sprinkle with salt and pepper; then bake until the heads begin to brown. To use the roasted garlic, simply squeeze it out of the skin; you can use as is or mash with a little of the oil from roasting. A wide variety of ingredients and flavors work well as additions to a basic hummus recipe. If you like the tang of olives, try a kalamata olive hummus where the black, briny olives are blended right along with the rest of the ingredients. Change not only the taste of the hummus but also the color by blending in some fresh boiled beets, or adding in sun-dried tomatoes for a little smoky flavor. Avocado and fresh herbs add welcome flavor and texture to typical hummus, or spice it up a bit by making a jalapeno hummus. You can even turn hummus into a hearty appetizer by topping it with a spicy beef mixture; the contrast of creamy hummus and ground meat make for a satisfying scoop with toasted pita bread.